« The Power, and Danger, of Symbols. 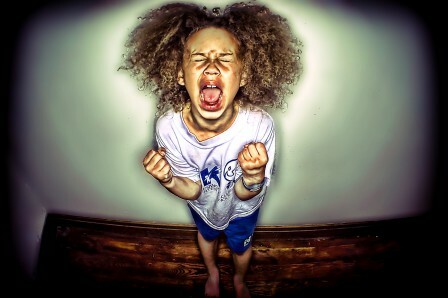 Tantrums are associated with young children, but of course humans at all ages throw tantrums. The angry boss screaming at an employee, the driver screaming in traffic, the person screaming at the telemarketer, the wife screaming at the husband — these are all “tantrums.” Most adults have occasional tantrums, but some unhappy souls experience them as habitually as a two-year-old. In its purest form, a tantrum is just a release of physical energy, often in reaction to an uncomfortable or threatening stimulus. Infants sometimes scream not because they are hungry, tired, or need a diaper change, but because their physical existence feels uncomfortable or overstimulating and they need to release that tension through shrieking. The physical release of a tantrum should not be suppressed, but at the same time, it is unwise to create any kind of mental drama around it. Learn to sit with tantrum energy — not react to it. The parent who gives his child a lot of attention or a sugary treat when he throws a tantrum in an effort to soothe the tantrum is, of course, only reinforcing the pattern. In reality, no one is being cruel to the toddler. But the toddler believes his parents are being terribly cruel. It the same with the adult who throws a tantrum. Usually there is a victim drama going on with the tantrum — life is unfair, how dare other people behave this way, etc. What the wise adult learns to do is to separate the physical release energy of a tantrum, from the mental victimhood drama. When you are hurt, scared, traumatized, or feel intense frustration and disappointment when a desire is thwarted, a physical release is often necessary. It is healthy to cry, to tremble, or engage in some sort of physical exercise or body movement in order to “blow off steam” and release the tension. What is not healthy is to suppress the physical release, and instead fester in the story of victimhood that arises with feelings of being hurt, scared, disappointed, or frustrated. Don’t feed that mental voice. Hear it, but don’t believe what it’s saying. Believing that voice is like giving the tantruming toddler ice cream because you believe you really are a bad parent if you don’t. It will only lock in a pattern of feeling victimized by life when you feel pain, fear, or frustration. It will only encourage more “victim” tantrums in your mind. Learn to separate the physical release of tension from the mental drama. One way to do this is to “get out of your head” when you feel the volcanic energy of a tantrum building up, and instead focus on the physical sensations in your body. For example, where do you feel the tension — your chest, your neck, your shoulders, etc. How does the tension feel — tight, sharp, buzzing, wet, black, etc. By focusing your attention on your body, not a mental drama, you allow the physical tension to release in a healthy way. Learn neither to suppress nor indulge other people’s tantrums. Don’t argue with someone who’s having a tantrum — arguing only feeds the energy — but don’t silently swallow whatever they’re saying, either. Don’t buy into whatever they’re shouting at you; they’re not thinking clearly. Just know that attention is the oxygen that feeds a tantrum, the way oxygen feeds a fire. With tantrum energy, you want the fire to discharge and cool down. Don’t add fuel to the flames. This is the essence of good parenting — and every adult needs a good inner parent.